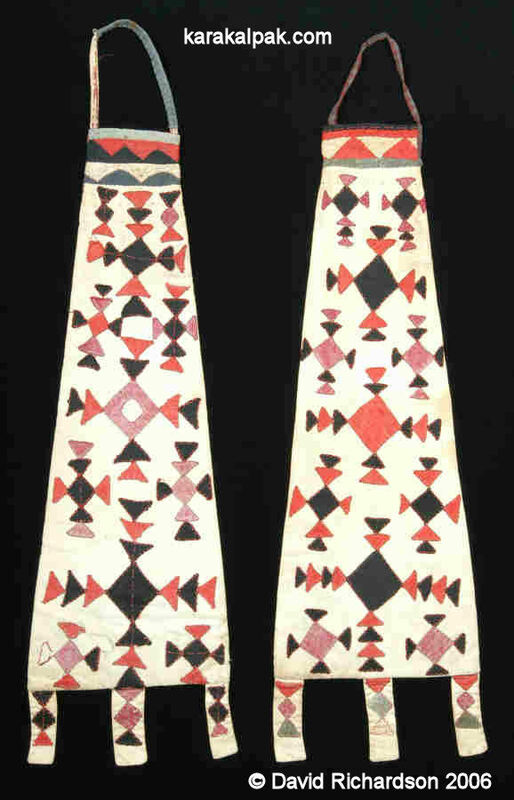 Two Karakalpak cotton un shanash used for storing bread flour. From a Mu'yten-Samat family living in Qarao'zek. The Richardson Collection. Shanash storage bags come in various forms - the word shanash simply means bag. One of the most common forms is a triangular cotton sacks for for storing millet, grain, ju'weri, wheat flour, rice or other dried goods inside the yurt. Leather bags of the same shape are also encountered . Often bags are named after the purpose that they serve. Thus a so'k shanash is a bag for fried millet and an un shanash is a flour bag. They are sometimes mistakenly called salt bags. Salt was readily available from local sources such as Barsakelmes lake and tended to be kept in dried pumpkin containers known as asqabaq or qabaq. Shal were larger and more primitive sacks made of rough goat hair or sheep’s wool or possibly coarse hemp. They were used for storing larger quantities of wheat grain, ju'weri grain or millet. Khorjins or Qorjıns (Karakalpak spelling) are Turkmen donkey-bags with locking loops for travelling. They are made as a single piece. Igor Savitsky thought that they may have been made by the Karakalpaks and to a very limited degree this might have been true. 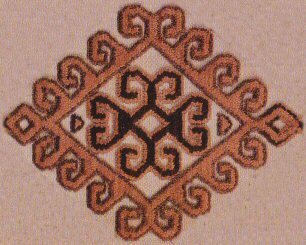 However the overwhelming majority are of Turkmen origin, being made using woollen warps and wefts and having a colour palette that is distinctly Yomut rather than Karakalpak. This page was first published on 6 July 2006. It was last updated on 8 February 2012.